US equity indexes settled the week/month on a positive note, sp +22pts (0.8%) at 2760. Nasdaq comp' +0.8%. Dow +0.7%. The two leaders - Trans/R2K, settled +1.3% and +0.5% respectively. 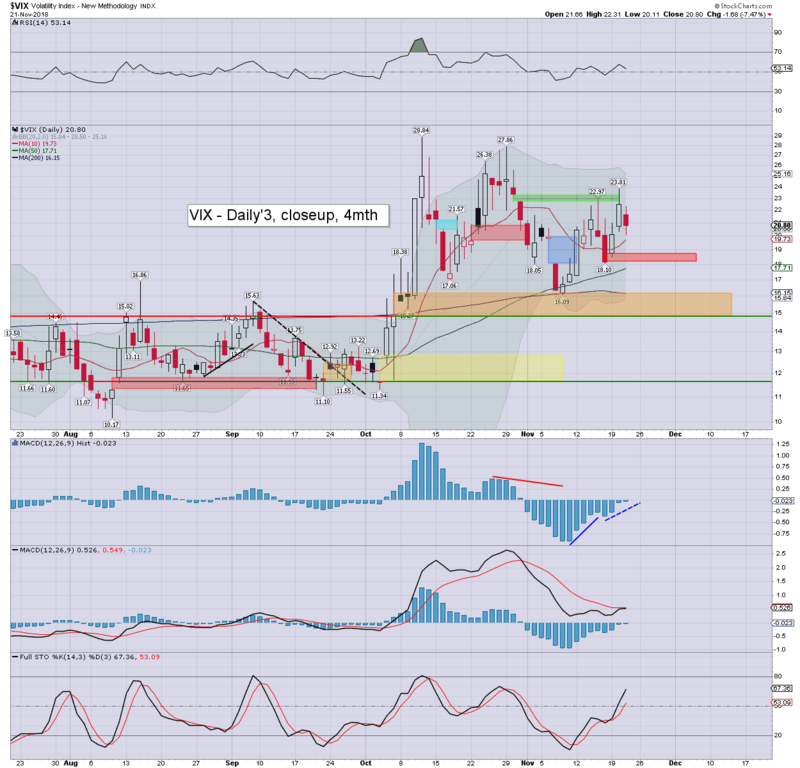 VIX settled -3.8% to 18.07. US equities opened in minor chop mode, and then made a push upward into/across the afternoon. The closing hour saw some further swings, seeing a micro spike in the final minutes. With equity strength, volatility melted lower, settling in the low 18s. The spx saw a net monthly gain of 48pts (1.8%). That cancels out the October bearish settlement, and the s/t outlook has to flip to bullish. Even if the Oct' low of 2603 is eventually broken under in Dec' or January, it can no longer be expected to be anything sustained. Today's Chicago PMI of 66.4 was a reminder that the US train is still on the tracks. 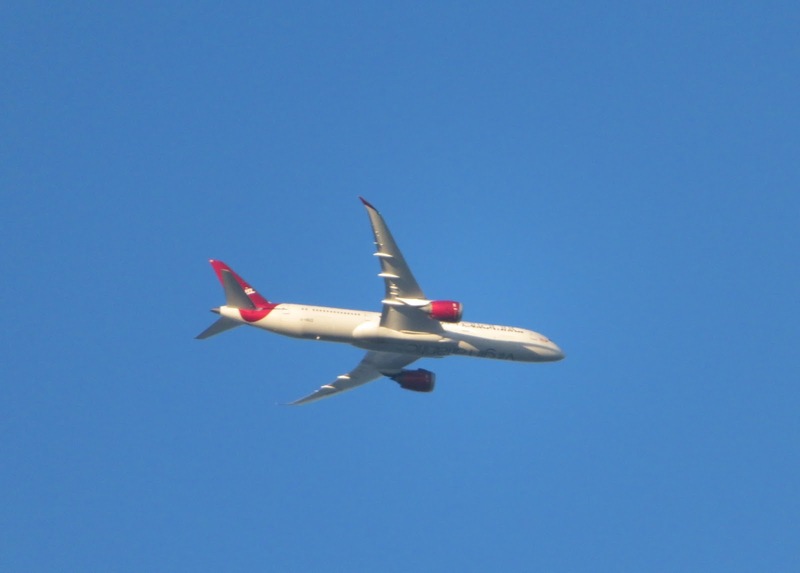 Hard landing into end month? US equity indexes closed on the weaker side, sp -6pts (0.2%) at 2737. The two leaders - Trans/R2K, settled -0.8% and -0.3% respectively. 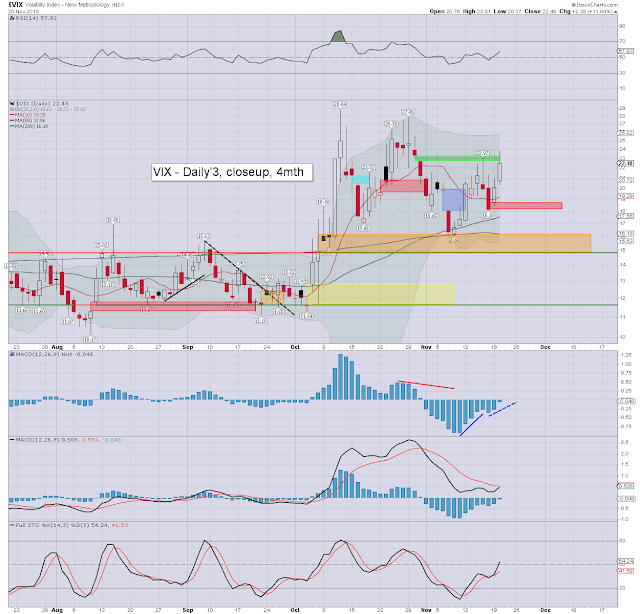 VIX settled +1.6% at 18.79. 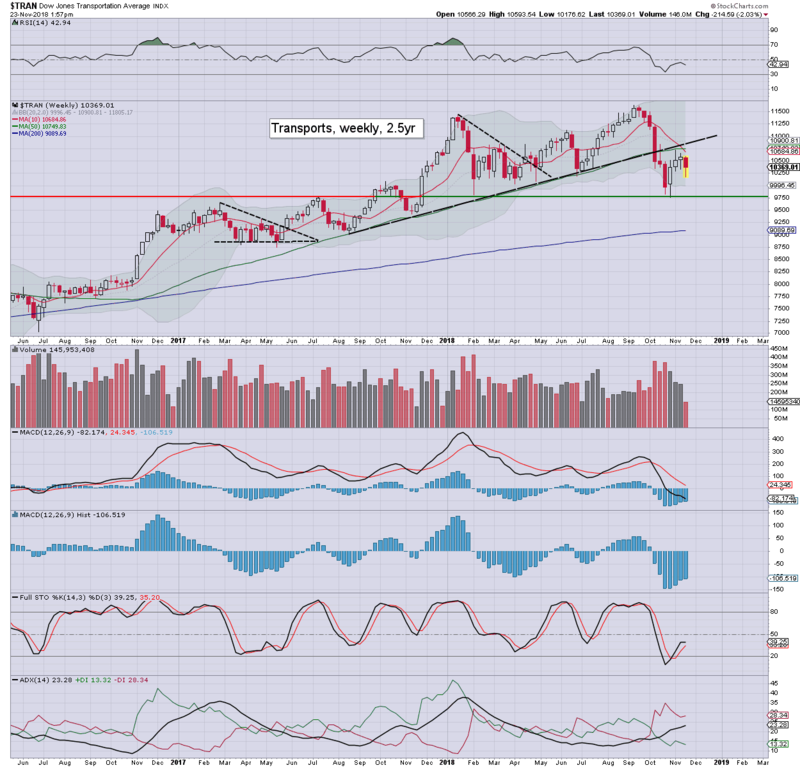 Near term outlook offers a cooling wave into the weekend/monthly settlement. US equities opened weak, with a late morning low of 2722, and then clawed back upward, even turning net positive in late afternoon. 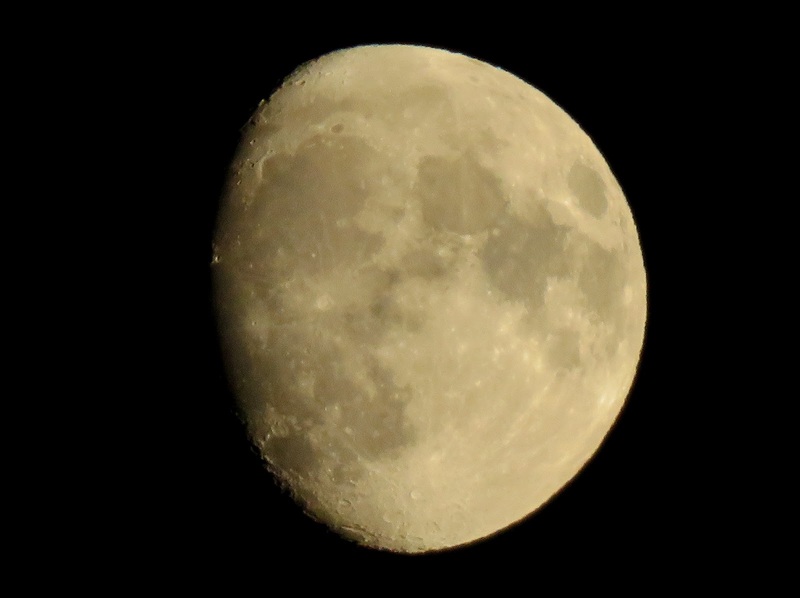 The closing hour saw a moderate cooling wave. Volatility saw a morning high of 20.48, but then melted back lower, settling in the upper 18s. Tomorrow is the monthly settlement of course, and it has to be asked if we might end on a very bearish note. The G20 'leaders summit' will begin, and will threaten sporadic news headlines across the day. 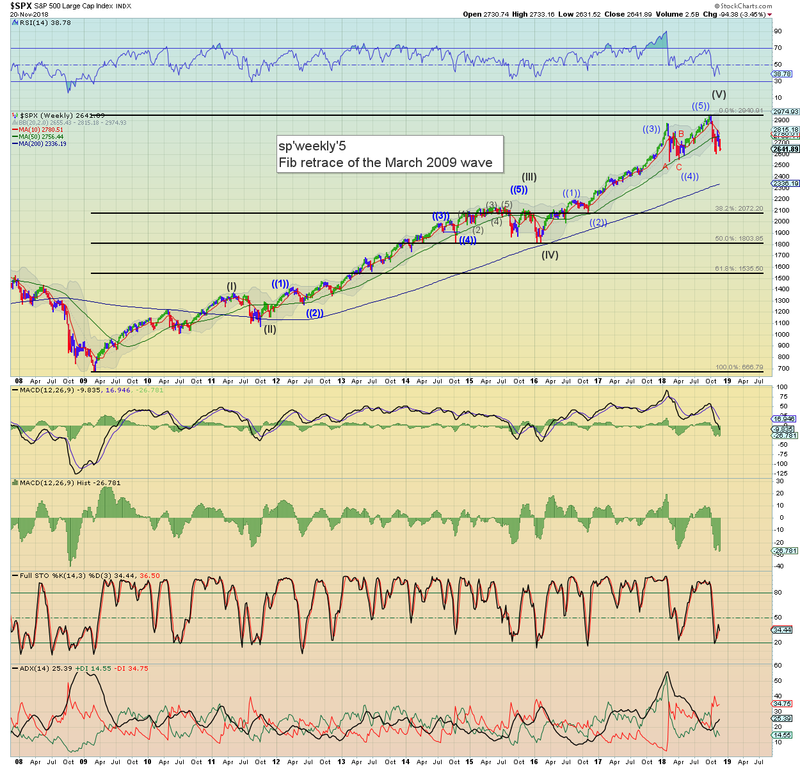 The equity bears should be content with any settlement under the monthly 10MA, currently at 2750. Considering the s/t cyclical setup, that does still look probable, and will give extra credence to the original notion of the October bearish close. 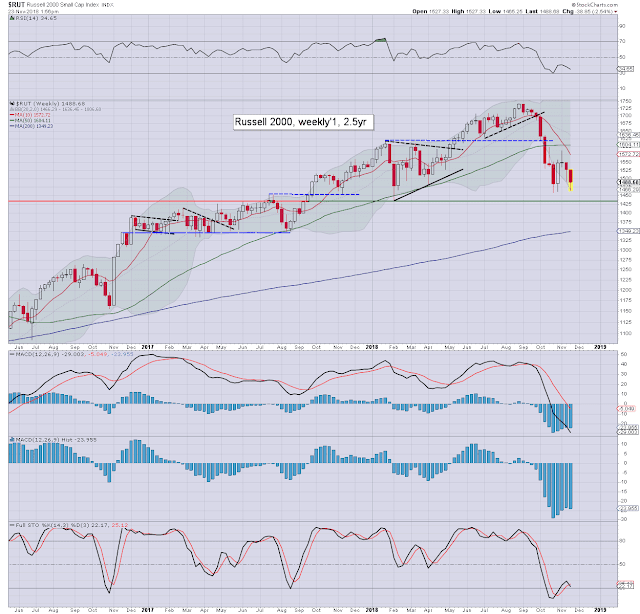 US equity indexes closed powerfully higher, sp +61pts (2.3%) at 2743. Nasdaq comp' +2.9%. The two leaders - Trans/R2K, both settled +2.5%. 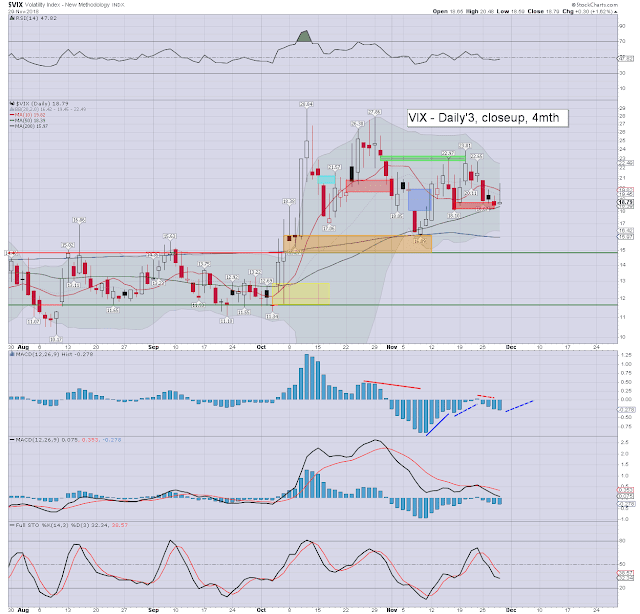 VIX settled -2.8% at 18.49. Near term outlook offers a cooling wave into the weekend/end month settlement. Equities opened moderately higher on hopes of soothing talk from Powell. 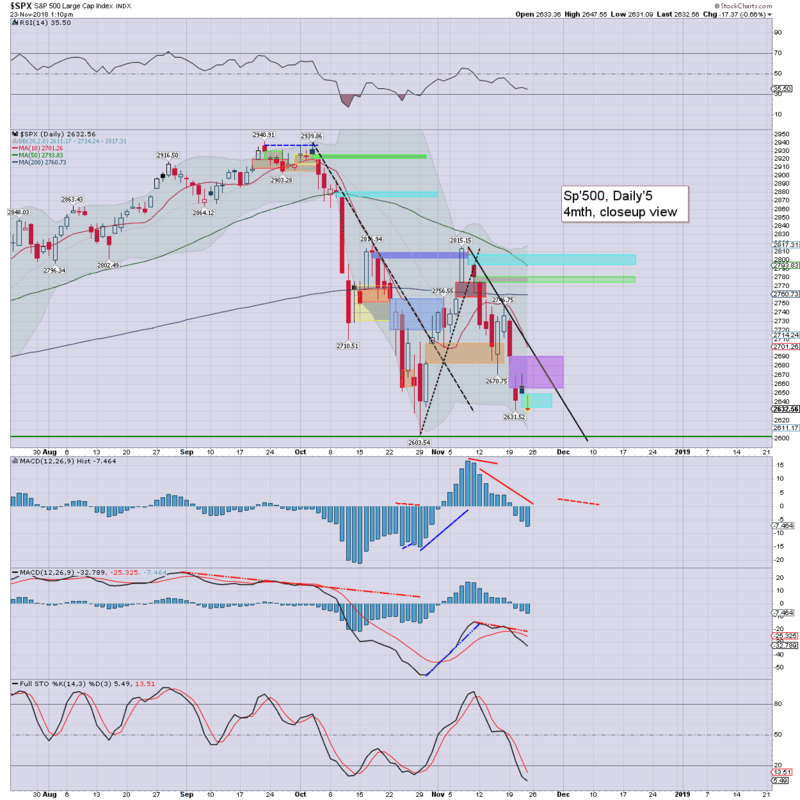 The gains were shaky though, with the spx' coming close to breakeven, before swinging back upward. The Powell speech was seen as Goldilocks, with equities soaring into early afternoon. 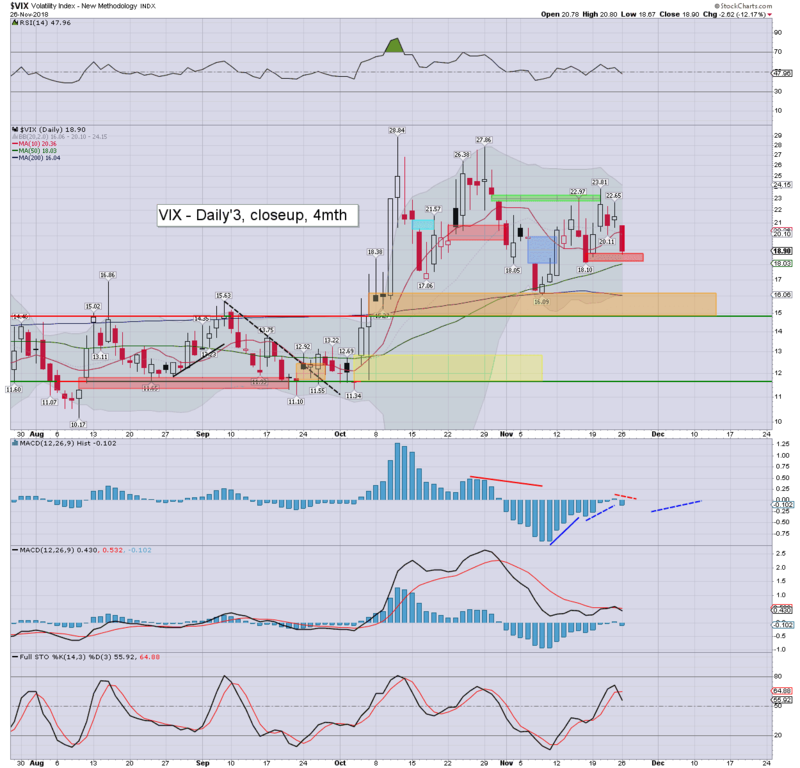 Despite strong equity gains, volatility relatively held up, with the VIX settling in the mid 18s. The VIX is often a subtle tell, and equity bulls should be concerned that the VIX did NOT confirm today's equity strength. S/t outlook offers a cooling wave into the weekend/end month. With just two trading days left of the month, the DAX is lower for a 4th consecutive month, currently -1.3% at 11298. There is near zero sign of a floor/turn. The German market decisively broke the l/t trend in October, and looks vulnerable all the way to 8k. US equity indexes closed mixed, sp +8pts (0.3%) at 2682. The two leaders - Trans/R2K, settled +0.3% and -0.9% respectively. 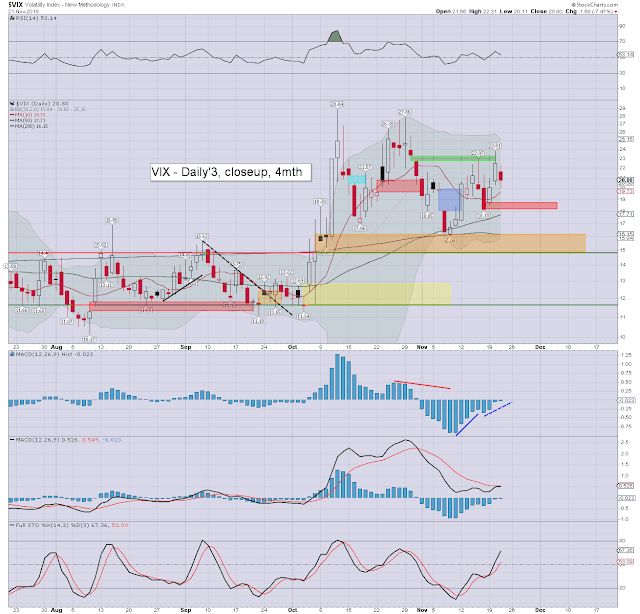 VIX settled +0.6% at 19.02. 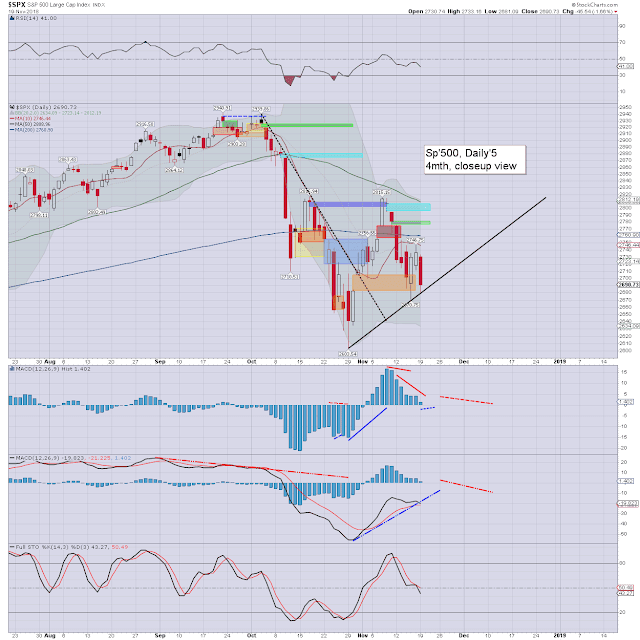 Near term outlook offers the 2690/700 zone, before another rollover into end month. US equities opened moderately weak, on the excuse of Monday-AH trade comments from Trump. Equities did reverse by mid morning, with a number of indexes turning fractionally positive. The afternoon saw further chop, leaning on the upward side. Volatility was itself subdued, with the VIX settling fractionally higher in the low 19s. 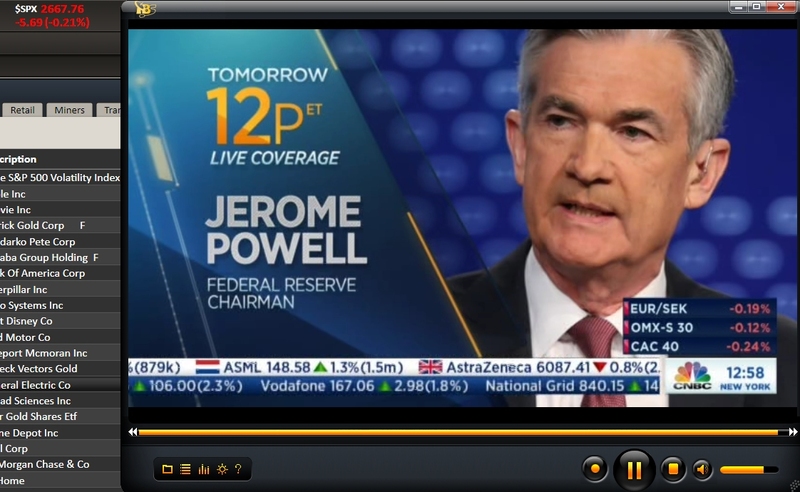 Wednesday will see Powell speak at the Economic Club of New York, and will garner live coverage on the financial networks. The mainstream want to be assured that Print Central will be data dependent across 2019, rather than the market's concern of a 'base case of 3 or 4 hikes'. 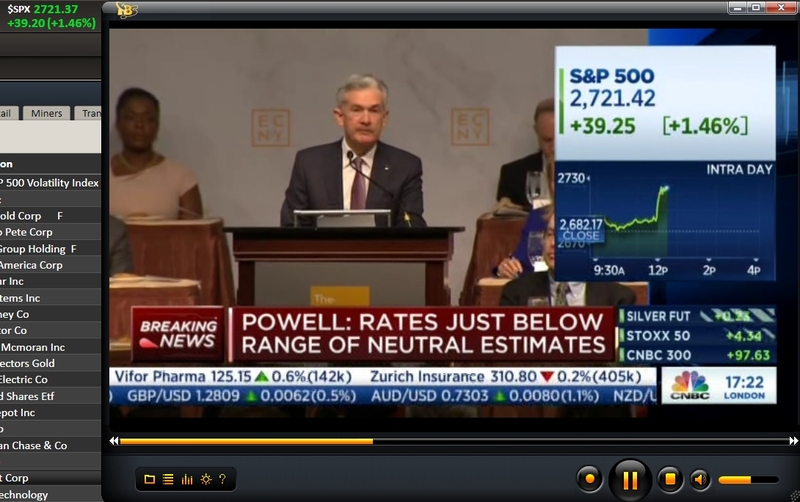 I'm sure Powell has a carefully scripted speech, that will attempt to placate the capital markets. The Dec'19th FOMC is still set to see rates hiked by another 25bps to a new target range of 2.25-2.50%. Once Powell is out of the way, the market will be vulnerable to a cooling wave into end month, not least on continuing trade uncertainty. 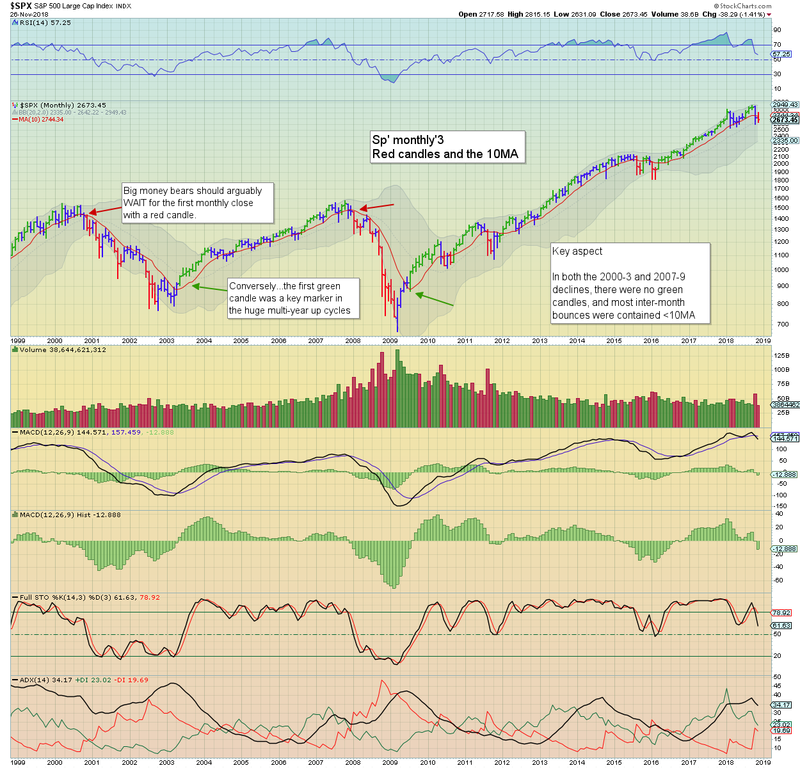 As things are, we're still on track for an outright bearish monthly settlement. US equity indexes closed significantly higher, sp +40pts (1.5%) at 2673. Nasdaq comp' +2.1% at 7081. The two leaders - Trans/R2K, settled +1.0% and +1.2% respectively. 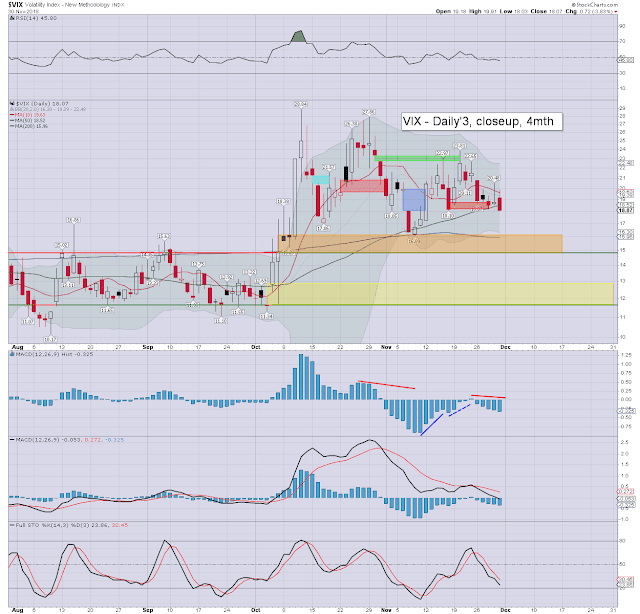 VIX settled -12.2% at 18.90. Near term outlook offers further upside to the 2690/2700 zone, but that won't be enough to prevent another bearish monthly settlement. The week began on a positive note, with the sp' settling +1.5%. 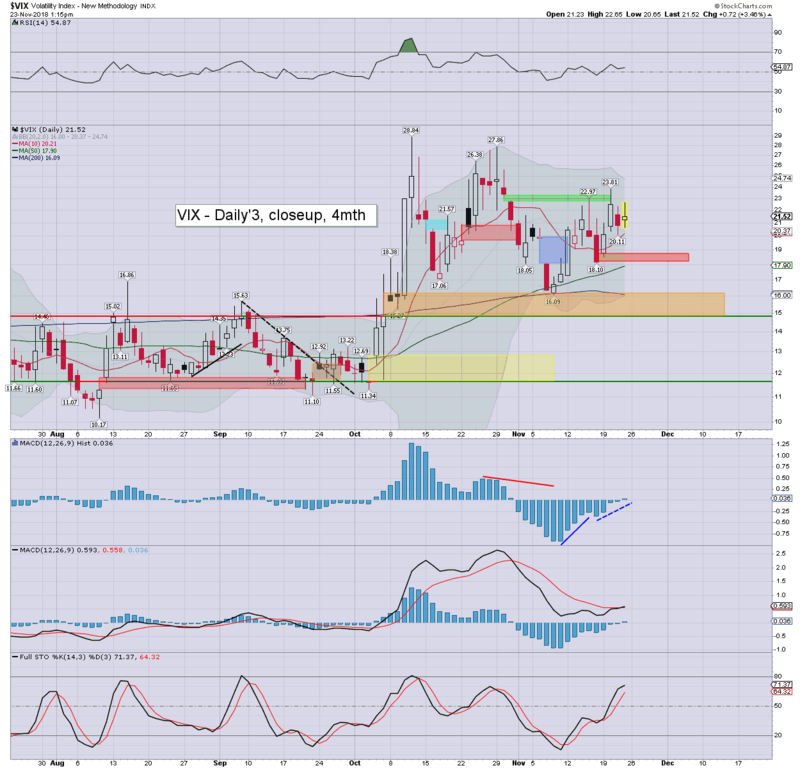 Volatility was in melt mode, with the VIX back under the key 20 threshold. With just four trading days left of November, the spx is -1.4%. 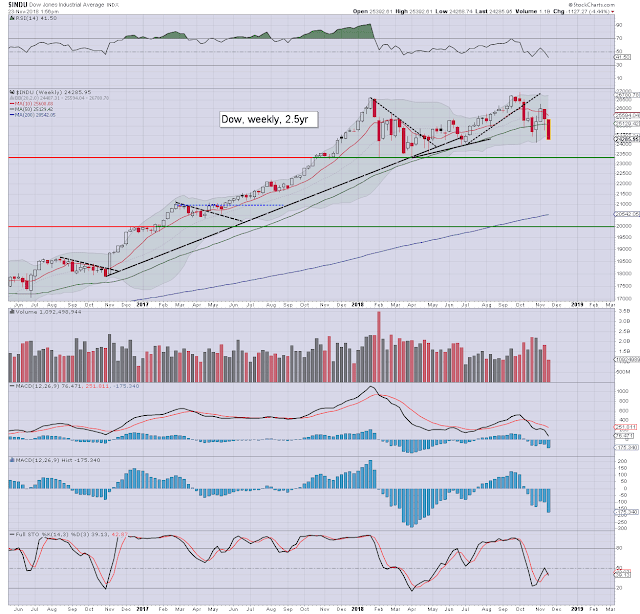 A monthly settlement above the key 10MA (2744) looks out of range, even if Powell and the G20 are net positive news items this week. Note the red Elder candle, which if it holds into the Friday close, would be the first since Feb'2016. A bearish November close will give extra credence to the October settlement. It was a very bearish week for US equity indexes, with net weekly declines ranging from -4.4% (Dow), -4.3% (Nasdaq comp'), -3.8% (sp'500), -2.9% (NYSE comp'), -2.5% (R2K), to -2.0% (Trans). The sp'500 fell for the 6th week of 9, settling -3.8% to 2632. The Oct' low of 2603 will likely fail to hold, and that will offer a challenge of the Feb' low of 2532... another 3.8% lower. 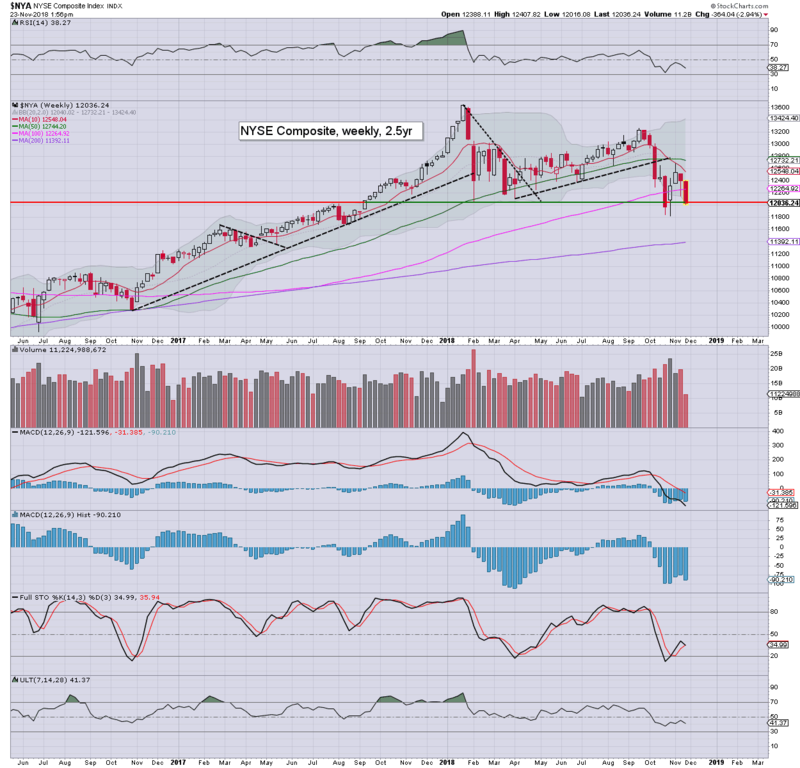 The Nasdaq declined for the 6th week of 8, settling -4.3% to 6938. Next support is the Feb' low of 6630, which is clearly viable within the immediate term. 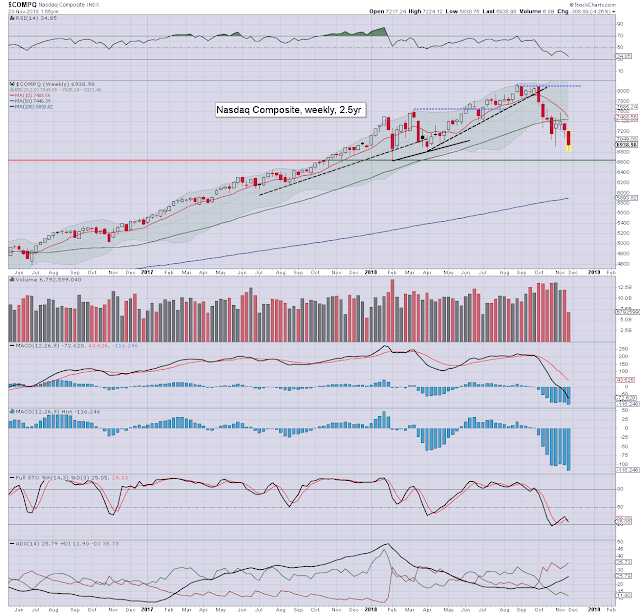 The bulls can't get confident again until >7600, and that does not look probable in the remainder of this year. 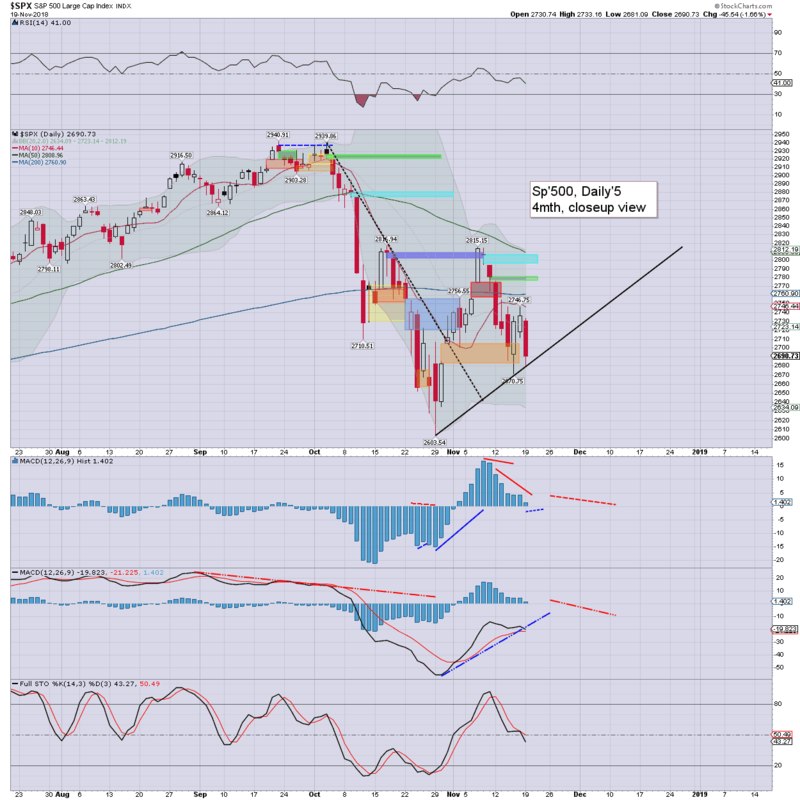 The mighty Dow is leading the broader market lower, settling -1127pts (4.4%) to 24285. The weekly candle is ugly, and leans to further weakness into end month/early December. 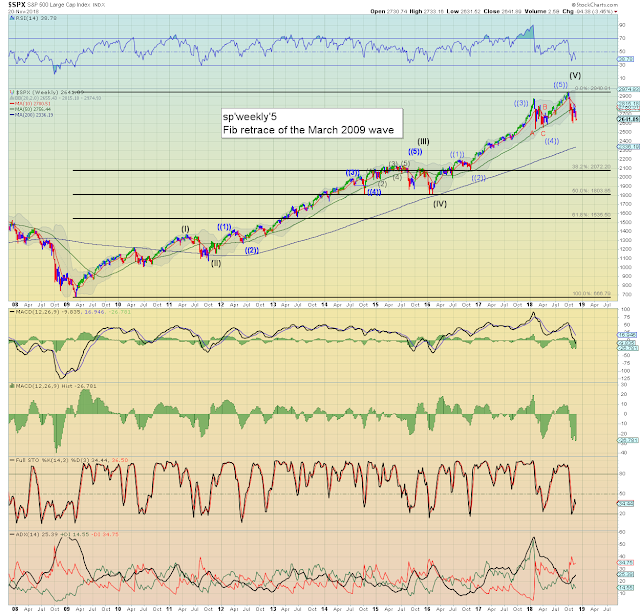 Support at the April low of 23344, and then its technically empty air to giant psy' 20K. The master index settled -2.9% to 12036... notably just below key price threshold. Next support (via monthly charts) are the 11400s. 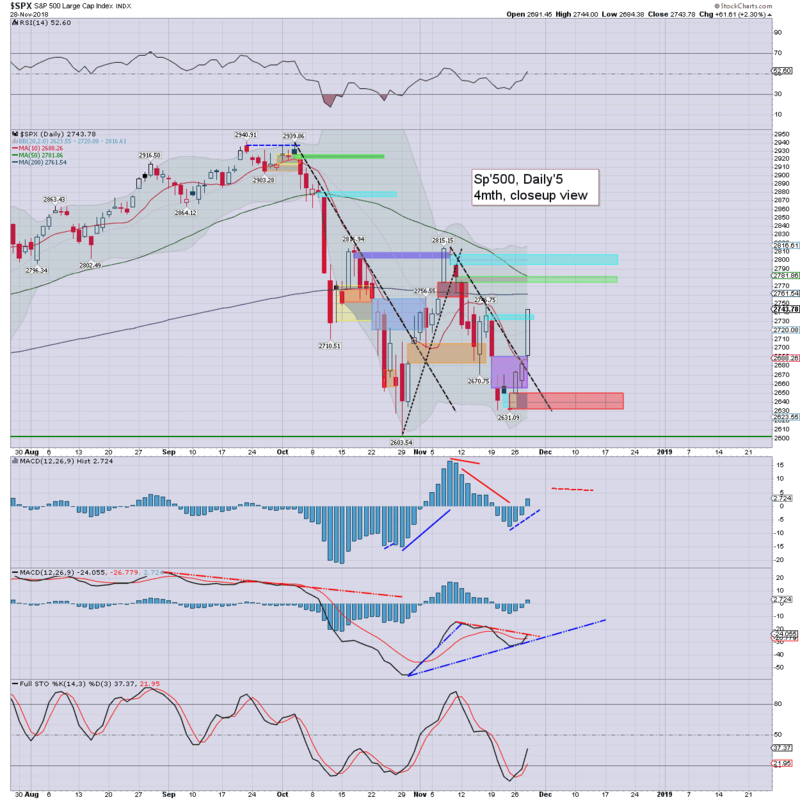 The R2k fell for the 9th week of 12, settling -2.5% to 1488. Whilst it could be argued the weekly candle is a little spiky on the lower side, there really isn't much support until the Feb' low of 1436, a mere 52pts (3.5%) lower. The 'old leader' - Transports was once again resilient against the main market (due to ongoing WTIC/fuel downside), but still settling sig' lower, -2.0% to 10369. Its notable that this index/sector has already broken below the Feb' lows. All six of the main US equity indexes settled significantly lower. The Dow and Nasdaq are leading the way downward, whilst the Transports remain relatively resilient. 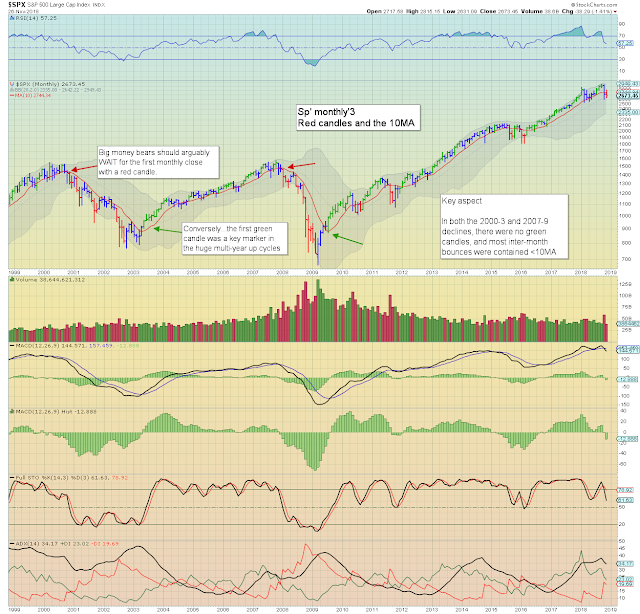 Only the Nasdaq remains net higher for the year, and by just 0.5%. The spx -1.5%, with the Dow -1.7%. 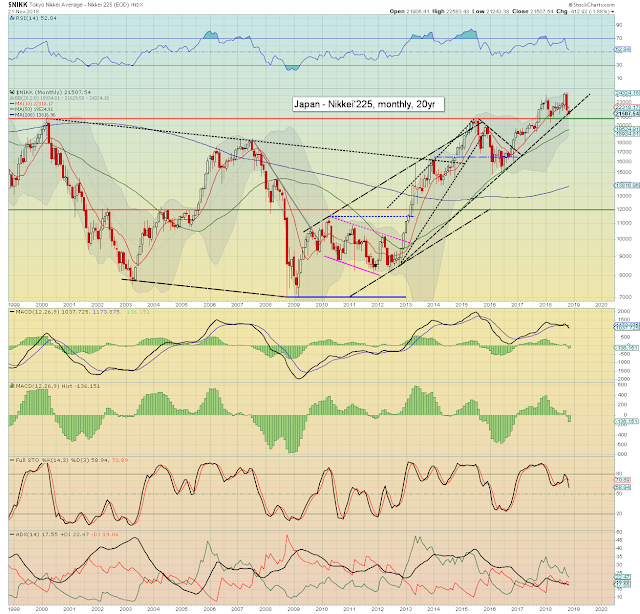 The Transports are -2.3%, the R2K -3.0%, with the NYSE comp' -6.0%. The weekend of Nov'24/25 will see all manner of BREXIT related discussions and votes, which will have significant bearing on how the week opens. More broadly, the market will be focused on the G20, which is being hosted in Argentina. The event begins Nov'26th, with the 'Leaders summit' spanning Nov'30th>Dec'1st. T - Case-Shiller HPI, consumer con'. W - GDP Q3 (2nd' print), intl' trade, new home sales, EIA Pet' report, FOMC mins. Powell is speaking at the economic club in NYC. That might garner live coverage. *the next post on this page will likely appear 5pm EST on Monday. US equity indexes closed on a weak note, sp -17pts (0.6%) at 2632. Nasdaq comp' -0.5%. Dow -0.7%. The two leaders - Trans/R2K, both settled u/c. Near term outlook is uncertain, ahead of a weekend of BREXIT related discussions/votes. November remains on track to settle outright bearish. The week ended on a slightly bearish note, as the equity bulls remained largely absent. 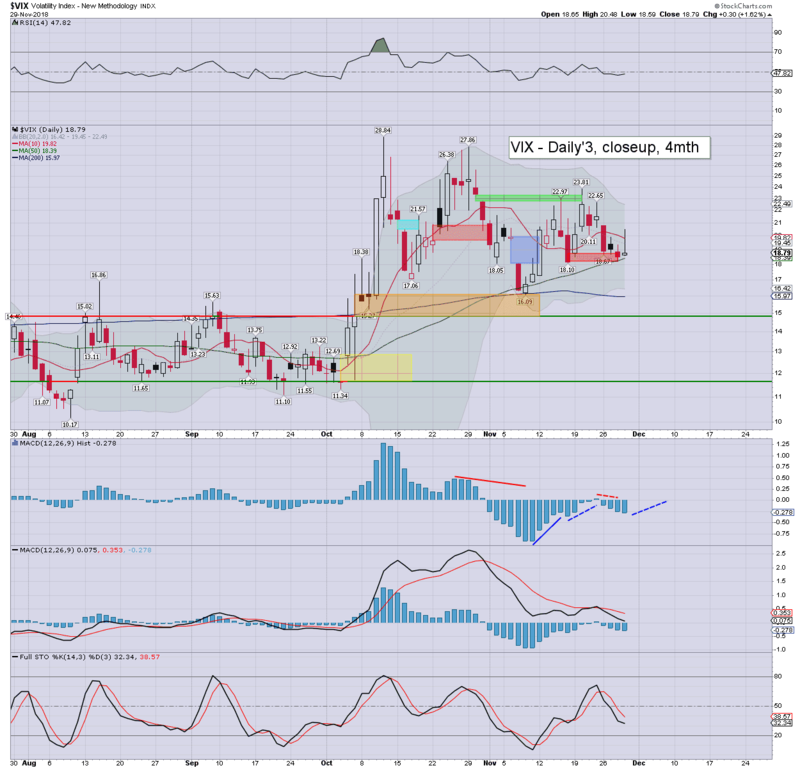 Volatility climbed for the 3rd day of 4, with the VIX settling the week above the key 20 threshold. S/t outlook is uncertain, due to weekend issues surrounding BREXIT. With five trading days left of the month, the spx is -79pts (2.9%) at 2632. 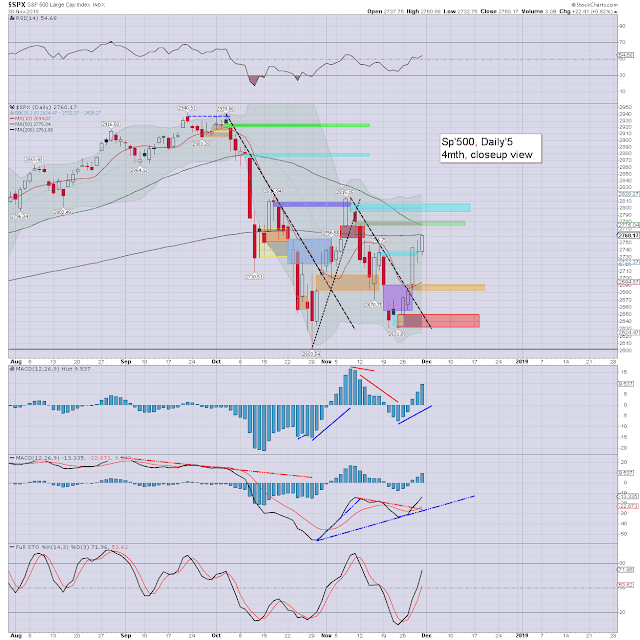 Note the key 10MA at 2740, some 108pts higher. 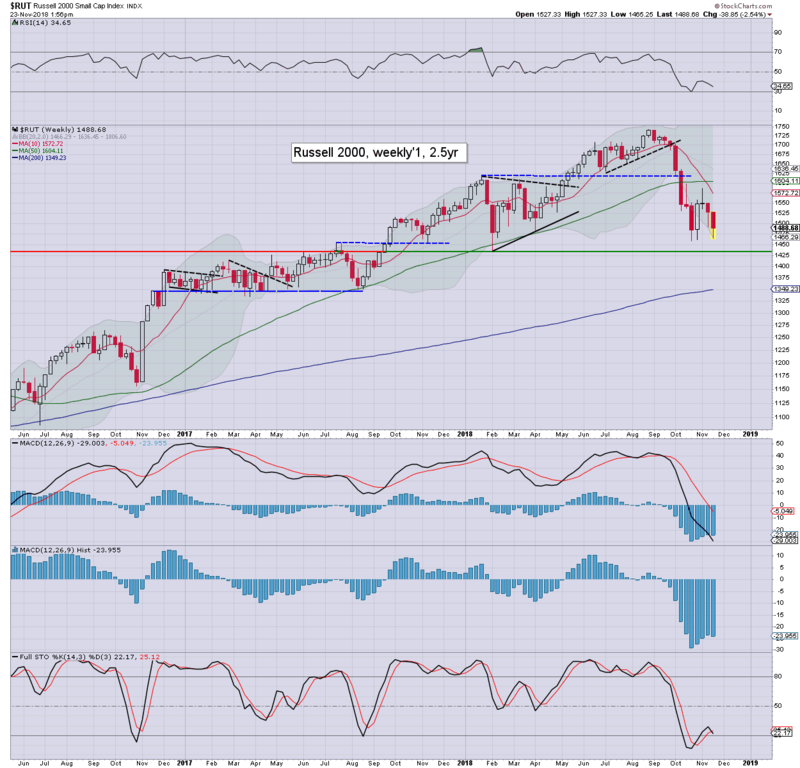 Its going to be very difficult for the bulls to avoid a second consecutive bearish monthly settlement. US equity indexes settled into Thanksgiving on a positive note, sp +8pts (0.3%) at 2649. The two leaders - Trans/R2K, settled +1.5% and +1.3% respectively. 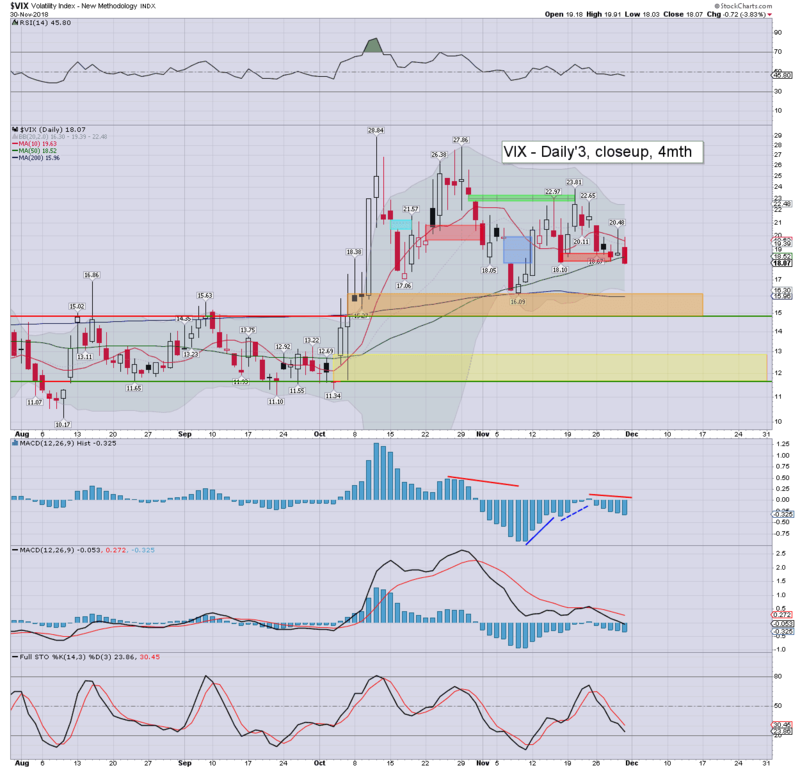 VIX settled -7.5% at 20.80. Near term outlook offers further weakness, with November on track to settle outright bearish. US equities caught a bounce into the Thanksgiving break, with the sp' seeing a morning high of 2670. 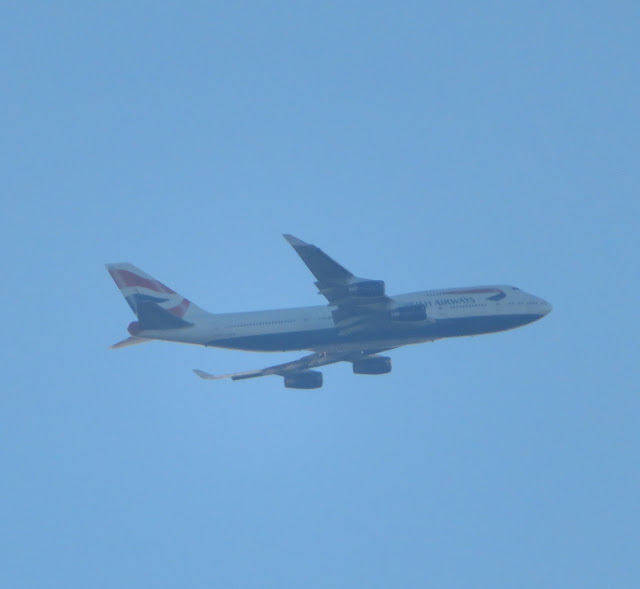 There was afternoon cooling though, especially into the close. Volatility was naturally in melt mode, but settling above the key 20 threshold. S/t outlook offers a weak equity open for the Friday half session, but the market should have opportunity to lean back upward into next week. The DAX is currently -1.8% at 11224. 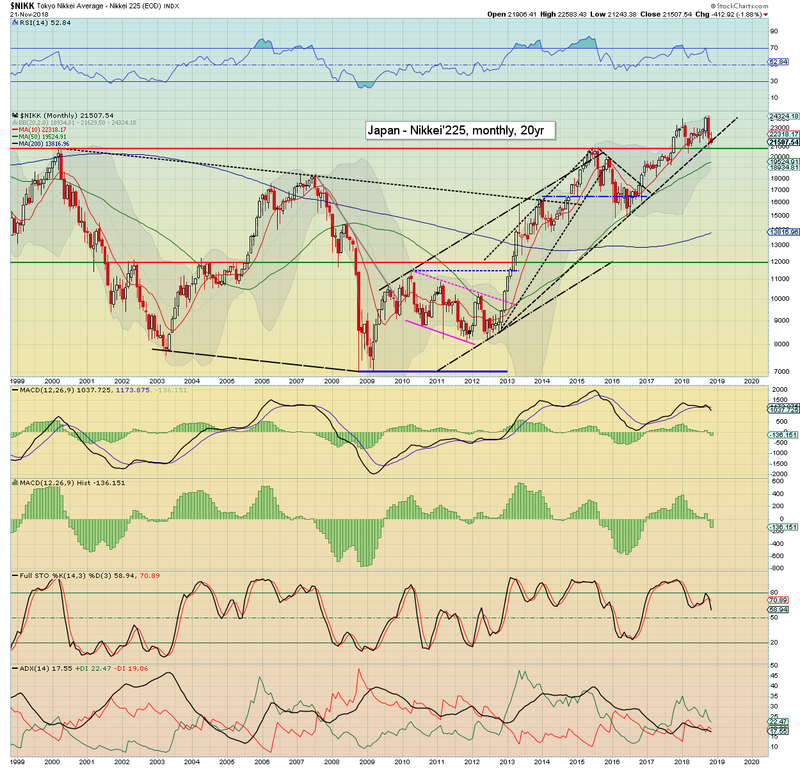 The m/t trend is bearish. Soft psy' 10K, then 8k. Currently net lower by -1.9% at 21507. 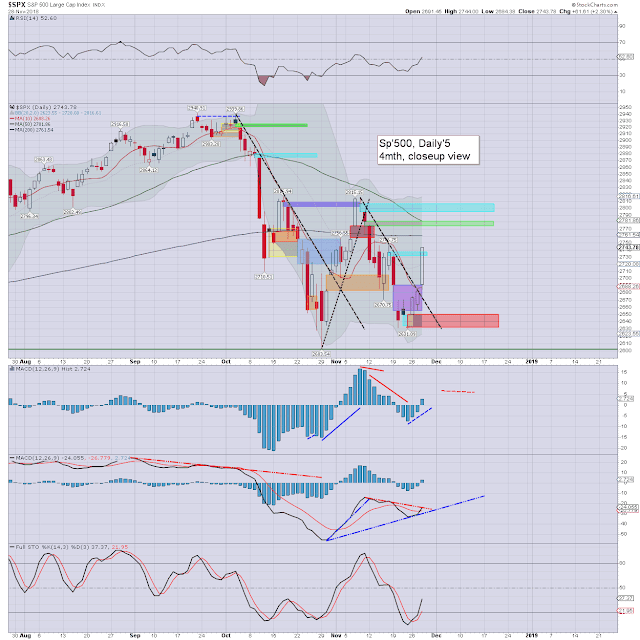 Things turn decisively m/t bearish under the Oct' low of 20971. To my US readers.... happy Thanksgiving! US equity indexes closed very significantly lower, sp -48pts (1.8%) at 2641. Nasdaq comp' -1.7%. Dow -2.2%. 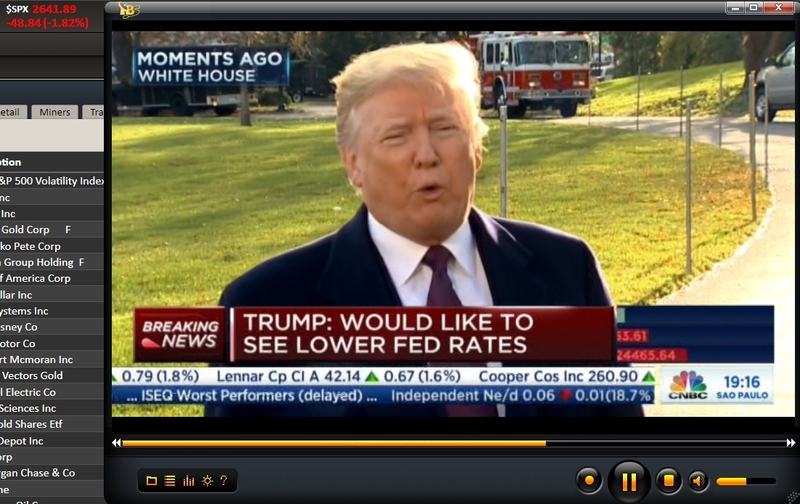 The two leaders - Trans/R2K, settled -3.0% and -1.8% respectively. Near term outlook offers a bounce, but the November settlement is on track to remain under broken mid/long term supports. US equities opened very significantly lower, and saw a morning reversal from 2632... just 29pts above the key Oct' low. The afternoon wasn't pretty though, with a new intraday low in the closing hour of 2631, with a 10pt swing to settle at 2641. 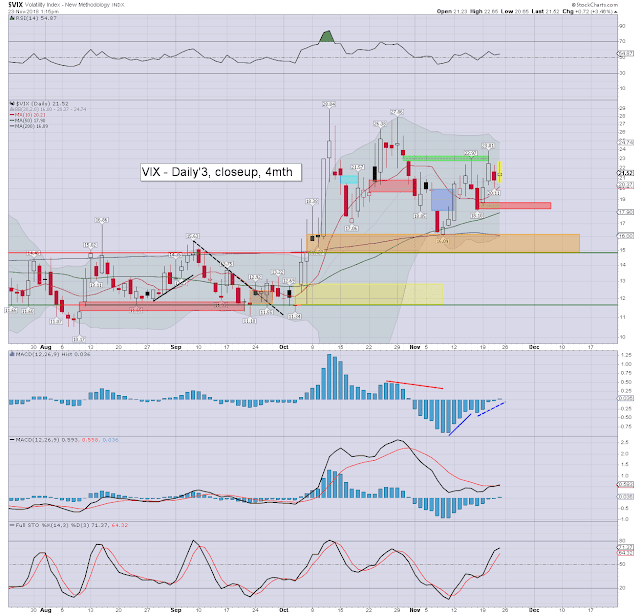 Volatility climbed for a second day, with the VIX settling in the mid 22s. I'm sure the US President would indeed like lower rates, and if equities remain broadly weak into 2019, we might see the fed panic, and suspend QT and/or cutting rates. THAT... would make for the ultimate sell signal. As the song goes, nothing lasts forever, even cold November rain. 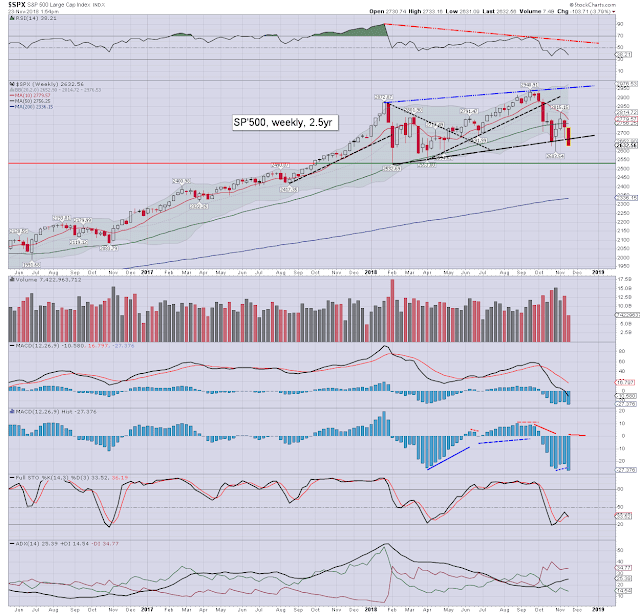 October saw bearish monthly closes (at least under my criteria) in most of the US equity indexes. 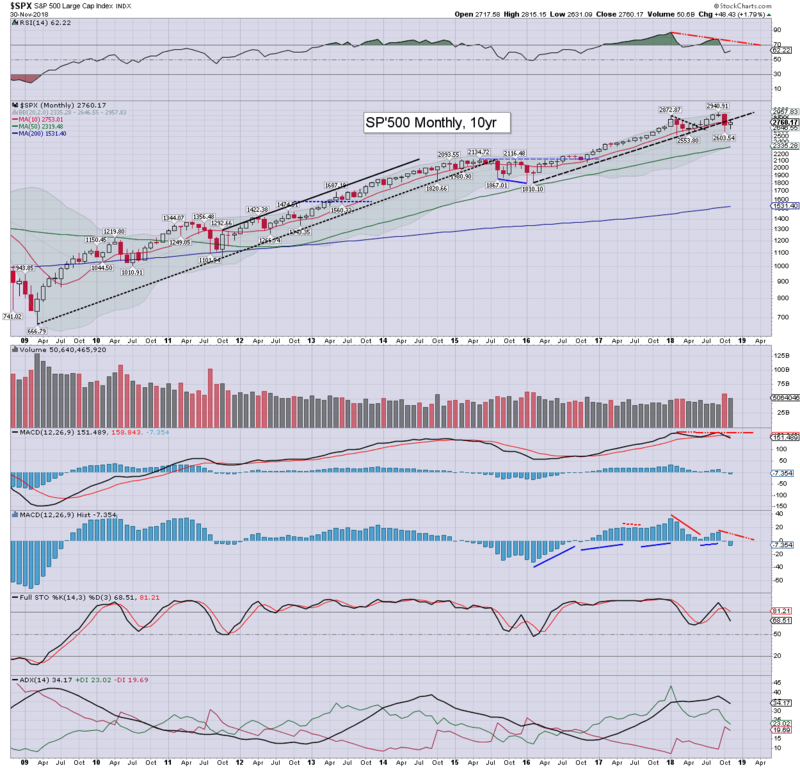 November hasn't been pretty, and with just 6.5 trading days left of the month, its not looking good for the bulls, with the spx on track to settle under the key monthly 10MA. I continue to endeavour to (usually) refrain from counting any of what is semi-chaos price action. However, I'll highlight the above legacy chart. If its right... then we have a l/t top. 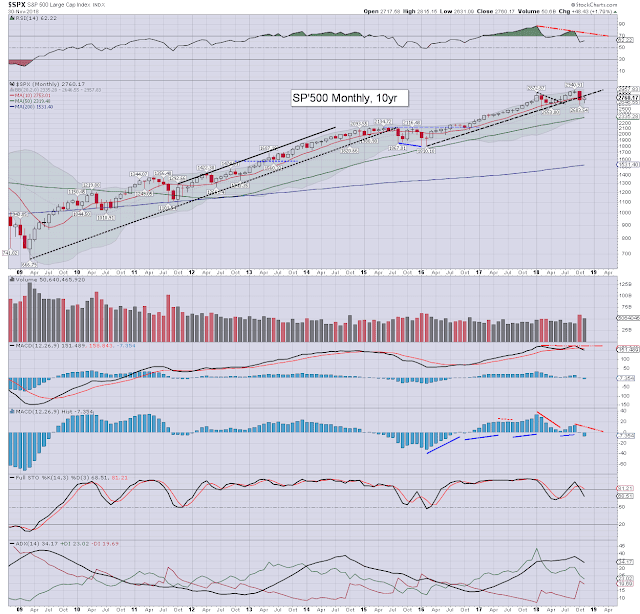 That notion would get dropped on any monthly close back above the monthly 10MA - currently at 2741. I know I'm not the only out there with a similar wave count. Any thoughts? US equity indexes closed significantly lower, sp -45pts (1.6%) at 2690. Nasdaq comp' -3.0% at 7028. The two leaders - Trans/R2K, settled -0.4% and -2.0% respectively. 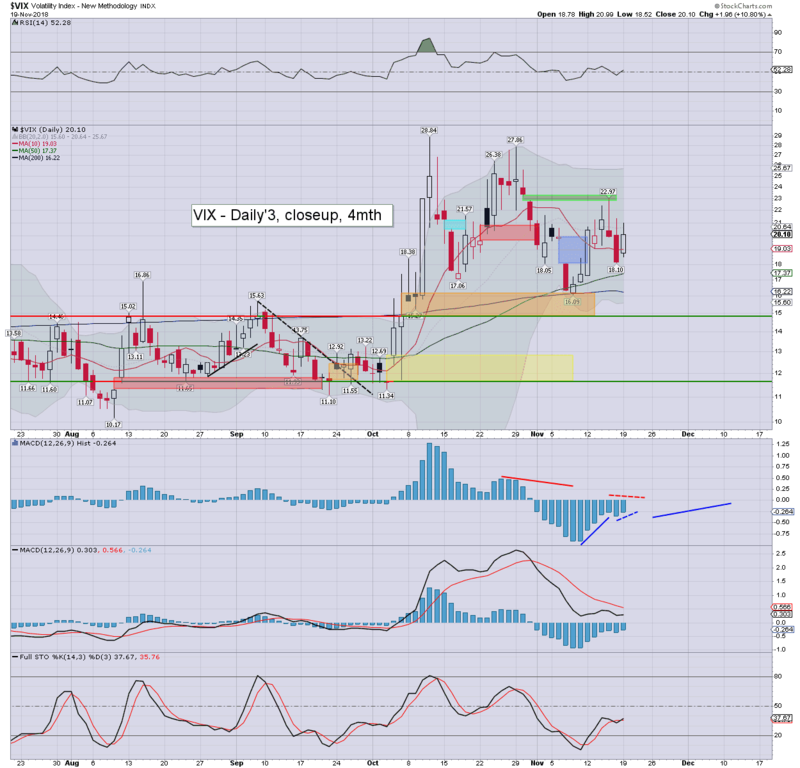 VIX settled +10.8% at 20.10. Near term outlook offers choppy upside into the Thanksgiving break, and then renewed weakness into end month. US equities opened moderately lower, and steadily cooled into the mid afternoon, seeing a low of 2681. There was a vain attempt at a latter day recovery, but the closing hour sure wasn't pretty. Volatility picked up, with the VIX settling back above the key 20 threshold. 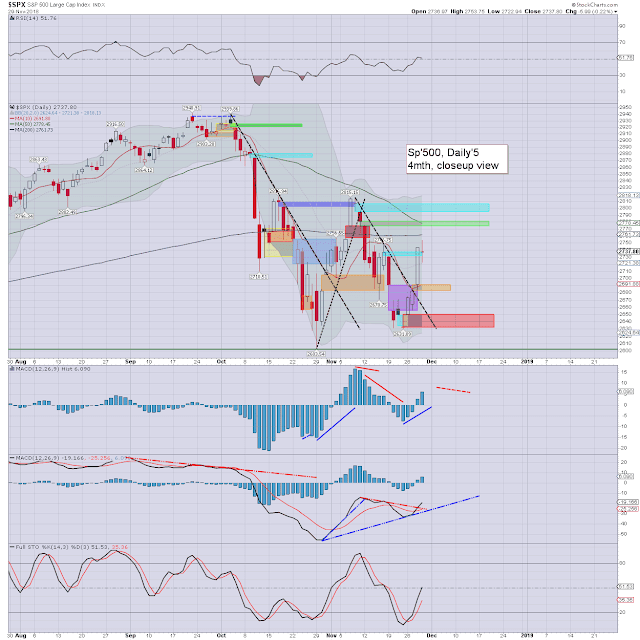 S/t outlook will favour the equity bulls into the Wed'/Thanksgiving break. 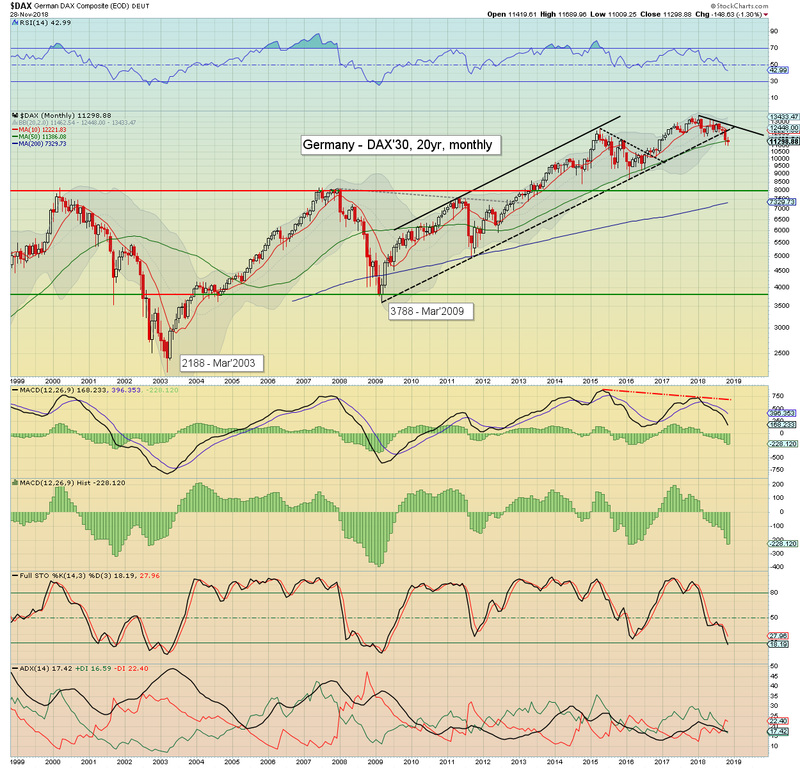 With nine trading days left of the month, the DAX is lower for the sixth month of seven, currently -1.8% at 11244. Soft psy' support at 10k, and then the old double top (now core support) of around 8k. If you believe the DAX is going to 8k, you can have some confidence about which direction the rest of the EU markets will trade into 2019, and to some degree... the US market. 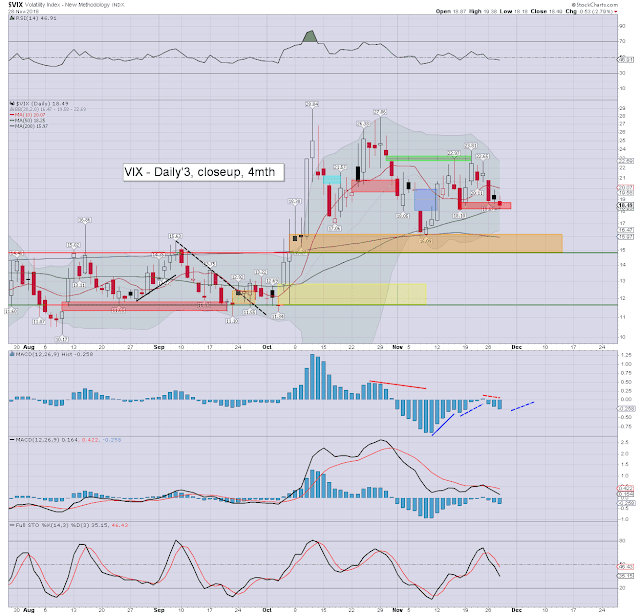 Last week saw some powerful upside in Natural Gas (NG) to $4.93, although it wasn't entirely surprising, as NG had broken and settled above core resistance of the $3.20s in mid October. From what I gather, the company was leveraged short NG, via naked put writing. Effectively... losses could have been infinite. Last week saw the fund not only lose ALL of its funds, but most (or all?) clients now have negative balances. Some will no doubt be able to throw more money to at least zero-balance their accounts, but not all. If I've instilled anything of use to you across the past few years, it is hopefully the notion that if you want to sleep soundly at night, then no margin/leverage! Across the many years, I've had some superb, and also horrific trades, but never have I had a sleepless night, worried about seeing my account balance turn negative. I simply never trade on margin, and I sure as hell sleep better for it.